Monday afternoons 1:00 p.m. to 4:30 p.m.
Delivering the essentials for business theory in a condensed, to-the-point format; this is an excellent course for anyone wanting an overview of the standard practices in business today. Through case studies, problem-solving exercises and interactive class sessions you will obtain the knowledge you need to succeed. 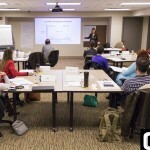 The Mini MBA will help you advance your understanding of business by providing a framework of knowledge for making informed business decisions on issues affecting your organization today. This program gives high potential employees the opportunity to firm up their business sense in an intensive learning program. You’ll spend each week developing a practical foundation in useful business practices and concepts used in business today. Don’t miss your chance to prepare for your future. Experienced managers who need a solid foundation in current business theory and practices. Technical professionals moving into management positions who need more management “know-how”. Managers looking to advance their careers, who need to become knowledgeable in a variety of functional areas. Those who need to broaden their understanding of how functional areas within a business interrelate. Executives or business graduates who need to update their fluency in business concepts and practices. Leaders facilitate the movement toward a common goal or shared objective. Leaders can be found in all types of organizations, but a common set of behaviors has been show to differentiate outstanding leaders from ordinary ones. This session examines the behaviors of outstanding leaders: challenging the status quo, inspiring a shared vision, enabling others to perform, setting an example and rewarding accomplishments. Firms exist to create value. The production or operations area of an organization is where the goods are produced, or services rendered, that justify the existence of the firm. With effective Operations Management (OM), a firm can gain competitive advantage by delivering high-quality and cost-competitive products and services. This session will cover some of the concepts and techniques related to designing, managing and improving operations. An organizations most important capital is its human capital. In this session, you will learn methods to ensure alignment of your people strategies to organizational goals. Additionally, you will assess and review methods to identify talent, align performance and develop your team to deliver results. Information technology (IT) impacts every facet of business from product supply chain to shipment and delivery, to accounts receivable and personnel management. IT enables business to be more efficient, resilient, and profitable…to have global reach yet retain local relevance. IT also presents business leaders with significant risk: legal, ethical, financial. Successful leaders will have an understanding of the national cyber legal and policy framework and know how to identify areas of legal risk associated with IT. This session will assist leaders in communicating technical concepts to colleagues and staff, as well as legal experts and to understand key legal concepts as applied to cyber security. Ethics is the heart of leadership. Understanding ethics makes business sense; it can contribute to organizational survival and success and make you a better leader and manager. The basics of ethics include a review of ethical terms, corporate examples, and in identifying dimensions of ethics. Business decision-making is frequently based on the judgment of managers and is not simply choosing right from wrong. Successful leaders understand how their personal character attributes can positively or negatively affect the organization. Managers need to be able to read and understand financial statements. This skill allows managers to better communicate with financial personnel and use the information to make good management decisions. Concepts used in preparing financial statements and interpreting their meaning will be an important part of this session. We will focus on key principles and practices of accounting including financial reporting, taxation, auditing and analysis. This session examines the fundamental functions of marketing management (analysis, planning, implementation and control) with respect to the driving mission of the organization – the creation and maintenance of long-term customer relationships that profitably satisfy customers’ needs. The effect of marketplace trends and recent developments in marketing will also be discussed. For decades, business collected data and stored it but did not use it much. Today, there are also free sources of secondary data on the Internet that firms can use in conjunction with the data they have available. Competitive firms are analyzing all this data with Analytics to gain insights into who their customers are and what they are purchasing. This session will cover some free sources of data on the Internet and the basic tools of Analytics. Managers and leaders need to know clearly what they want for their organization or department and how they will get there. Thinking strategically is the framework for operational plans. This session will illustrate the process to enable participants to focus on the long-term perspective while operating in the present. Identify the key elements required to achieve a cohesive path to reach organizational goals and objectives. An organization will struggle without a structured plan and business map in place to define its objectives. Gain a better understanding of how to formulate methods to integrate a strategic plan and vision into your organizational culture. Most organizations speak openly and frequently about quality service and customer satisfaction. However, most managers have difficulty defining these terms and even more difficulty in measuring them. In management “if you can’t measure it, you can’t manage it.” In this session we define quality and customer service and illustrate proven methods to develop a measurable quality and customer driven culture in your organization.